Folks, it is National Poetry Month, which means we really should try to answer an important question: What is poetry? Or, as many might feel is a more appropriate way of asking the question, What the heck is a poem, anyways? This is a very valid question that comes from a very genuine place. I think there are many avid readers out there, readers who consume novels and non-fiction with a kind of ardor, who still come reluctantly to poetry, and wonder how or why people connect to that particular art form. What is poetry? How does it differ from the other art forms, like visual art, or theater, or music? Isn’t poetry a kind of music? And isn’t it something you have to look at to appreciate its form, and therefore isn’t it kind of like visual art? One of my favorite descriptions of what poetry is comes from the scholar Elaine Scarry, who writes in Dreaming By the Book that our various art forms all participate in different kinds of content. What does this mean? Scarry points out that many art forms, like visual art and music, involve “immediate sensory content.” We hear a song or a symphony, we see a painting or sculpture. Our senses come alive during these interactions, and the content is immediate and sensory. But what about things like musical scores? That’s art, isn’t it? Scarry calls that “delayed sensory content.” In this case, the notes call attention to a sequence that, if honored, produces actual music. But there’s one more kind of content, and this is my favorite one. For what happens when we read a novel or a poem? There is “immediate sensory content” – the weight and feel of the book in our hands, the smell of the pages, the color of the black letters printed into the white page, the different shapes of the letters. But when we read, we are not only engaging in immediate sensory content, because the letters on the page, as in a musical score, are instructions that help us to imagine a world. In this case, we are engaging not only in immediate sensory content and delayed sensory content but also…. (drumroll please) “mimetic content.” So what’s that? Mimetic content does not include any sensory content – it is, rather, what we see, touch or hear through our imagination and memory. Scarry then points out that the visual arts, film, theater and music are all focused primarily in immediate sensory content, whereas the verbal arts are more grounded in mimetic content. Phew! That was a lot of theorizing. I hope it wasn’t too off-putting. But we have one more step to take, so that we can think about poetry, and more specifically think about what poetry is. For poetry, more than the other art forms, participates in all three forms of content outlined by Scarry. It’s immediate sensory content participates through the visual form of the words on the page. Its delayed sensory content participates through the way in which the notations on the page are intended to produce actual sound. And its mimetic content participates through the way in which the poem activates our imaginations, the way it sings in our mind. Yes! We are (hopefully) getting somewhere. But there is actually one more distinction we have to make. And that’s this: what’s the difference between novels and poems? Both are weighted primarily in mimetic content. Both involve the production of worlds, through language, in our imagination and memory. So how do we differentiate between the two? I don’t have an easy answer to this, but I think it has to do with the aspect of poetry that involved delayed sensory content and immediate sensory content. How do I mean? Well, most poems have a certain form – maybe it’s a long stanza, with rolling and exuberant lines, a la Walt Whitman. Maybe it’s a short stanza, with more restrained lines, a la Emily Dickinson. The point being, when one reads a poem, its form is so essential to its content. Reading a novel, we of course imbibe the paragraph breaks, but the form of the language is not as paramount as it is in poetry. That’s the immediate sensory content. But also, poetry, like music, is a form of singing. Poetry touches upon the boundary that separates language from music, in a way that I don’t think novels often do. Many novelists employ musical language – Vladimir Nabokov is a good example of that; Proust is another. But poetry and music, I think, are more intertwined than prose and music. So that’s my librarian talk for today, with help from Scarry. And, as it is the first day of National Poetry Month, I feel I would be amiss if I did not include a poem. 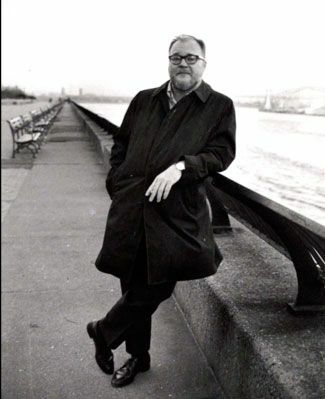 So, dear readers, as a great example of poetry’s always-noble attempt to simply break into song, here is a favorite of mine, James Wright’s (Ohio poet) “A Blessing.” Enjoy!